Bail Handles - Airsan Corp. 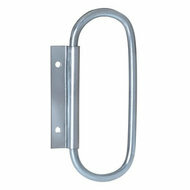 Bail handles are supplied (at customer request) to aid in the removal of filters from housings. To order bail handles along with a filter, add a "B" to the catalog description suffix. Examples: WGG2-2020B, AFGG2-2020B. Airsan bail handles may also be ordered separately and are sold in pairs. BAIL HANDLES ARE SUPPLIED (AT CUSTOMER’S REQUEST) TO AID IN THE REMOVAL OF FILTERS FROM HOUSINGS. BAIL HANDLES MAY BE ORDERED WITH THE FILTER BY ADDING A “B” TO THE CATALOG DESCRIPTION SUFFIX. EXAMPLES: WGG2-2020B, AFGG2-2020B. BAIL HANDLES MAY ALSO BE ORDERED SEPARATELY AND ARE SOLD IN PAIRS.